Trading in slaves was permitted by all ancient and medieval legislations; even Christian Europe allowed it down to the thirteenth century. 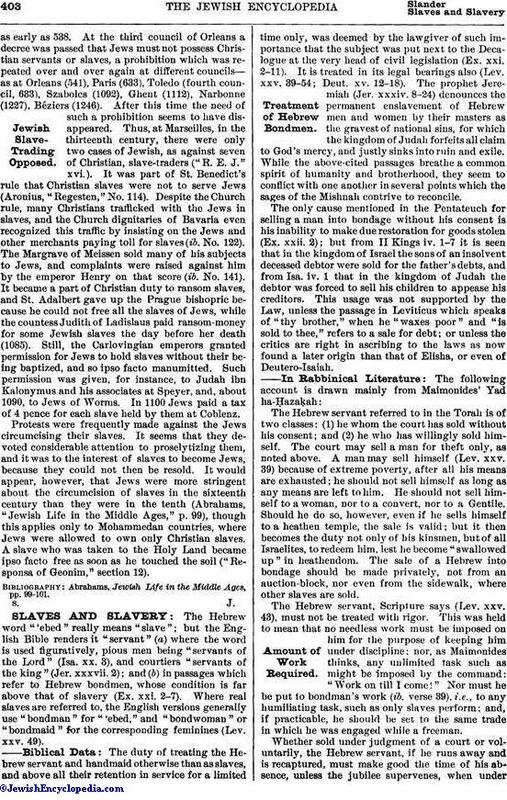 At an early stage traffic in Jewish slaves was forbidden to Jews, but there appears to have been no restrictions in law or sentiment against the purchase and sale of heathen slaves (see Slaves). With the dispersion of the nations in Europe, and the conflicts arising from the divergence of creed between the Arians and the Catholics in Spain, opportunity was given to the Jews, who were equally hated and equally licensed, to supply both with slaves. Pope Gelasius (492) permitted Jews to introduce slaves, if they were heathen, from Gaul into Italy. At the time of Pope Gregory the Great (590-604) Jews had become the chief traders in this class of traffic. He objected to the Jews holding Christian slaves ("Epist." ix. 109) because he feared that they would be converted to Judaism (ib. iv. 21); and he wrote to the Bishop of Naples that the Jews dealt in Christian slaves which they bought in the Gallic territories (ib. ix. 36). It has been suggested by Jacobs that the British slaves who had been brought to the Roman market, attracting Gregory's attention to the need of Christianizing England, were in the hands of Jewish slave-dealers ("Jews of Angevin England," p. 5). 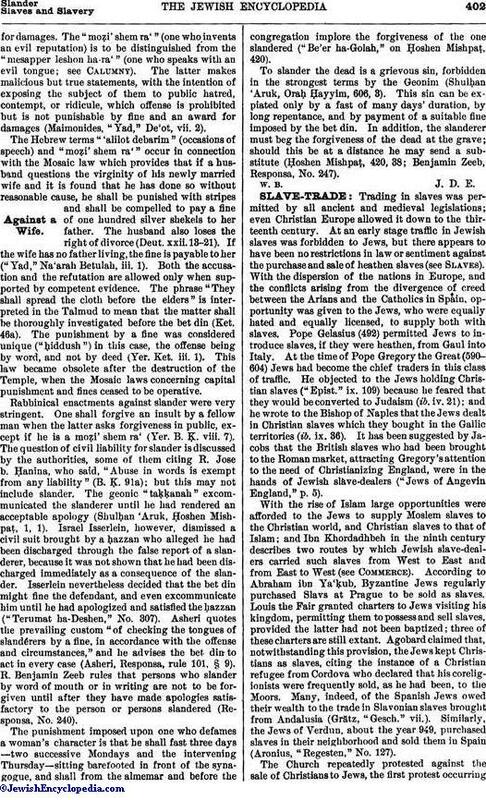 With the rise of Islam large opportunities were afforded to the Jews to supply Moslem slaves to the Christian world, and Christian slaves to that of Islam; and Ibn Khordadhbeh in the ninth century describes two routes by which Jewish slave-dealers carried such slaves from West to East and from East to West (see Commerce). According to Abraham ibn Ya'ḳub, Byzantine Jews regularly purchased Slavs at Prague to be sold as slaves. Louis the Fair granted charters to Jews visiting his kingdom, permitting them to possess and sell slaves, provided the latter had not been baptized; three of these charters are still extant. Agobard claimed that, notwithstanding this provision, the Jews kept Christians as slaves, citing the instance of a Christian refugee from Cordova who declared that his coreligionists were frequently sold, as he had been, to the Moors. Many, indeed, of the Spanish Jews owed their wealth to the trade in Slavonian slaves brought from Andalusia (Grätz, "Gesch." vii.). Similarly, the Jews of Verdun, about the year 949, purchased slaves in their neighborhood and sold them in Spain (Aronius, "Regesten," No. 127). The Church repeatedly protested against the sale of Christians to Jews, the first protest occurringas early as 538. At the third council of Orleans a decree was passed that Jews must not possess Christian servants or slaves, a prohibition which was repeated over and over again at different councils—as at Orleans (541), Paris (633), Toledo (fourth council, 633), Szabolcs (1092), Ghent (1112), Narbonne (1227), Béziers (1246). After this time the need of such a prohibition seems to have disappeared. Thus, at Marseilles, in the thirteenth century, there were only two cases of Jewish, as against seven of Christian, slave-traders ("R. E. J." xvi.). It was part of St. Benedict's rule that Christian slaves were not to serve Jews (Aronius, "Regesten," No. 114). Despite the Church rule, many Christians trafficked with the Jews in slaves, and the Church dignitaries of Bavaria even recognized this traffic by insisting on the Jews and other merchants paying toll for slaves (ib. No. 122). The Margrave of Meissen sold many of his subjects to Jews, and complaints were raised against him by the emperor Henry on that score (ib. No. 141). It became a part of Christian duty to ransom slaves, and St. Adalbert gave up the Prague bishopric because he could not free all the slaves of Jews, while the countess Judith of Ladislaus paid ransom-money for some Jewish slaves the day before her death (1085). Still, the Carlovingian emperors granted permission for Jews to hold slaves without their being baptized, and so ipso facto manumitted. Such permission was given, for instance, to Judah ibn Kalonymus and his associates at Speyer, and, about 1090, to Jews of Worms. In 1100 Jews paid a tax of 4 pence for each slave held by them at Coblenz. Protests were frequently made against the Jews circumcising their slaves. It seems that they devoted considerable attention to proselytizing them, and it was to the interest of slaves to become Jews, because they could not then be resold. It would appear, however, that Jews were more stringent about the circumcision of slaves in the sixteenth century than they were in the tenth (Abrahams, "Jewish Life in the Middle Ages," p. 99), though this applies only to Mohammedan countries, where Jews were allowed to own only Christian slaves. A slave who was taken to the Holy Land became ipso facto free as soon as he touched the soil ("Responsa of Geonim," section 12). Abrahams, Jewish Life in the Middle Ages, pp. 99-101.